According to lore, the spider in Celtic myth was a beneficial being. It appeared in the old texts suddenly, emerging from some now-forgotten lost older oral tradition, creepy-crawling onto the pages of recorded folklore from out of nowhere. Lady Wilde later echoed these sentiments – those of a beneficial spider – in her 1887 book Ancient Legends, Mystic Charms, and Superstitions of Ireland. She claimed the Transylvanians and the Irish shared the belief that one should, “Never kill a spider.” The text implies this would attract misfortune. Two brothers are travelling through a forested countryside, when they come across a beggarly old woman. The first brother ignores the woman, while the second gives her all of his coins. As a reward, the old lady gives the generous brother a walnut, which she claims contains a wasp with a diamond stinger. The older brother becomes annoyed at his younger brother’s generosity, but opts to continue the journey without much further discussion. As they’re riding, however, the brothers come across a young boy who’s shivering in the wind. The younger brother gives the boy his cloak without any thought, much to the dismay of his older brother. The child in return gives him a dragonfly (winged needle), which is being held in a cage made from Reeds. The child claims that the dragonfly was captured from within a hollow tree[i]. The brothers continue on their way, until eventually, they come upon an old man who says that he cannot walk. Filled with compassion, the younger brother gives the old man his horse. In return, the old man gives the generous brother a hollow acorn (Oak nut), which he claims contains a spider. By this point, however, the older brother is furious. Angry at his younger brother’s foolishness, the older brother leaves him cold, penniless, and without a mount. He tells the younger brother that he will not share his horse, his coin, or his cloak, nor will he wait for him any longer. The older brother seems quite convinced that the younger brother will learn his lesson if he’s forced to walk and to suffer, so he leaves him. As the older brother rides away, however, a giant eagle snatches him from the saddle and carries him into the clouds. The younger brother, horrified, witnesses the act and sees that two eagles have committed it. One of these eagles is white, and the other one is red. The younger brother, distressed, wonders aloud as to how he will be able to rescue his older brother. Seemingly, from out of nowhere, he hears three tiny voices from out of his pocket. These voices beg to help him. Seeing a possible answer to his dilemma, the younger brother unleashes the three deadly insects. The spider springs forth and immediately weaves a ladder towards the heavens from upon the dragonfly’s back. The group then ascends into the sky, and into the lair of the giant responsible for the kidnapping. A battle of epic proportions ensues. The wasp stings out the eyes of both eagles and the giant. 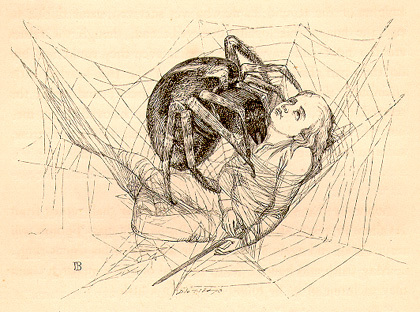 The spider then attacks, and wraps, the giant within its steel–like web. Suddenly, the eagles switch sides, blindly pecking the giant to death through the spider’s binding webs. The eagles both die on the spot, however, because as the story goes, a magician’s flesh is incredibly poisonous. In the aftermath of carnage, the dragonfly and wasp transform into horses and attach themselves to the Reed cage, which has now become a coach. The spider, on the other hand, has become the carriage’s groom. The brothers get in, and the coach carries them through the sky[ii]. The carriage then carries the brothers to their horses, where the younger brother also finds a much fuller coin purse and a diamond-studded cloak. Upon arrival, the carriage disappears and the three insects, which have already been transformed once, now assume their true forms. In their place are three shining angels which light up the sky. The brothers fall to their knees and thank the divine beings for all of their aid and for saving their lives. This tale, though Christian by the time of its recording, echoes a much older belief that all of nature, however humble it may appear on the surface, could in fact be a sacred spirit or divine being in disguise. Somewhat contrarily, Alexander Carmicheal’s 1900 Carmina Gadelica says there’s a “bloody flux” in cattle believed to be caused by the animal swallowing a water insect or a Spider, believed to have caused the bleeding in the animal. As a reward, Goll mac Morna is given Finn’s daughter, Keva of the White Skin. The story is incredibly symbolic. If we take the tale as being metaphoric, instead of more literal, then clearly the three hags, and their webs, represent one’s own fate or destiny. While Finn and his men (already semi-divine) are powerless, Goll mac Morna (an exterior force) is able to free them. At one time, weaving was a necessary practice in the daily life of a Celtic community. As trades became more specialized or industrialized, however, and folk came to view nature as something separate and evil, the spider, the spinning wheel, and the act of weaving itself, lost their mystique, their value, and even their sacredness. Like it or not, if nature’s ever to be viewed as sacred once more, then so must the Spider. To gaze upon a spider’s web, as it reflects an intricate array of light and complexity, one can be reminded that there’s more to the creeping quiet Spider than initially meets the eye. Sacred or not, the Spider shows itself to be an amazing product of evolution. To the Celtic people of the past, this observation must have been nothing short of divine. [i] The Hollow Tree is usually a Yew. [ii] Ancient Alien theorists would claim that this story of flying through the air is indisputable evidence that Aliens co-existed with humans in the past. [iii] An oral fungal infection. [iv] Goll mac Morna is described as: “the raging lion, the torch of onset, the great of soul.” He disappears in between the two battles and is not ensnared by the web. The story suggests he’s not human. This entry was posted in Bestiary and tagged animal, belief, beneficial, Celtic, evil, Fairy, fate, Folklore, goddesses, insects, Irish, legends, loom, nature, sacred, Spider, spinning, traditional, wasp, weaving, webs, welsh. Bookmark the permalink.